We’d love your help. Let us know what’s wrong with this preview of Are We Alone? Philosophical Implications of the Discovery of Extraterrestrial Life by Paul Davies. 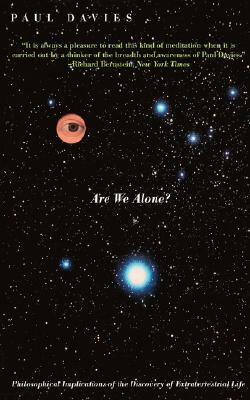 To ask other readers questions about Are We Alone? Philosophical Implications of the Discovery of Extraterrestrial Life, please sign up. Interessante. Un breve compendio di ciò che potrebbe implicare la scoperta della vita fuori dal pianeta terra, sia in campo filosofico che religioso e scientifico. A surprisingly deep analysis of the potential answers to the title question. Somewhat too dogmatic, but it raises some rather interesting points. The author Paul Davies is no crank; he's a science professional who's written several popular science books on physics and astrophysics. ARE WE ALONE? is based on his lectures about the search for extraterrestrial life. He outli Full disclosure: I think most UFO reports can safely be dismissed as unreliable or false. ARE WE ALONE? is based on his lectures about the search for extraterrestrial life. He outlines the history of speculation about aliens since antiquity; scientific theories about the number of alien civilizations (and why we haven't found any signs of them); and the actual search for alien communication signals by radio telescope. Most interesting is Davies' argument that life is NOT a "cosmic accident" but an inevitable product of natural processes. That is, there's no rational reason to assume we are "alone" in the universe, since life will spontaneously emerge elsewhere. Die Erde wurde in 7 Tagen geschaffen. Dann kamen die Geologen und sagten "ne". Naja, immerhin steht sie im Zentrum des Universums. Bis dieser Kopernikus kommt und sagt "ne". Naja, immerhin sind wir Menschen das Ziel der Schöpfung. So ein Engländer namens Darwin sagt "ne", wir stammen vom Affen ab und alles ist nur Auslese. Uff. Na, wenigstens sind wir einzigartig im gesamten Universum. Und dann bauen die dieses vermaledeite Radioteleskop, haben die den Knall nicht gehört? Abgesehen davon, dass ich befürchte, dass wir als erstes Signal von den Außerirdischen das arkturianische Pendant zu "Frauentausch" oder "Ab ins Beet" empfangen werden, so ist das ganze Thema doch sehr interessant - und zwar nicht nur von der rein naturwissenschaftlichen Seite aus betrachtet, sondern auch von der philosophischen. Dieses Buch beschränkt sich bei der Betrachtungsweise hauptsächlich auf die Argumente, die es für und wider die Existenz, und falls es es geben sollte, für und wider die Möglichkeit einer Kontaktaufnahme mit extraterrestrischem Leben. Dass hier kein von Däniken (den ich als Autor sehr schätze) am Werk ist, spürt man schon am distanzierten Schreibstil, und daran, dass der Autor seine Meinung zwar klar kundtut, dies aber immer als seine Meinung und nicht als Fakt deklariert. Kritiker kommen ebenso zu Wort wie Befürworter, und von der Wunderhypothese über anthropische Zustände über Panspermie bis hin zur Stringtheorie werden diverse Argumentationsketten vor dem Leser spannend und lehrreich ausgebreitet. Einen Aspekt, den andere bei ihrer Diskussion über außerirdische Intelligenz gern übersehen, wird hier besonders aufgearbeitet - was ist eigentlich Intelligenz, und wozu braucht es Intelligenz eigentlich? Ist Intelligenz und Bewusstsein vielleicht eine Zielfunktion des Universums? Einzige Voraussetzung, diesen sehr lesbaren Text genießen zu können, ist ein allergröbstes Verständnis von Physik und Statistik. Gerade die Statistik wird in diesem Werk sehr häufig zu Rate gezogen, schließlich muss man bisher, mangels physischer Beweise, mutmaßen. Das Gesetz der großen Zahlen in Verbindung mit der Unendlichkeit des Universums scheint über die Diskussion über nichtirdisch entstandenes Leben (was nicht dasselbe ist wie außerirdisches Leben, wie wir erfahren werden) viel Spielraum für zusätzliche Spielereien, wie der des kosmischen Duplikats, zu bieten. Die Titelgebung der englischen Werke ist hier etwas verwirrend - man sollte als Leser das vorliegende "Are we alone?" aus 1995 nicht verwechseln mit dem 2010 erschienenen "The Eerie Silence - Are We Alone in the Universe?". Auch biegt die deutsche Untertitelung die vom Autor beabsichtigten "philosophical implications" frecherweise um in schnöde "Wahrscheinlichkeit". Einige recht simple Illustrationen sowie eine Bibliografie komplettieren das Werk. The biggest shortcoming of this book is the fact that I read it 20 years after its publication. There's no doubt that its contents would be dramatically different if it were written in 2014, not because we've discovered life outside our planet, but because the heart of the book is a philosophical exploration of consciousness and patterns of evolution. I'm sure these fields have grown in interesting ways since 1995. This book is exactly what I expected it to be: An overview of the SETI program, co The biggest shortcoming of this book is the fact that I read it 20 years after its publication. There's no doubt that its contents would be dramatically different if it were written in 2014, not because we've discovered life outside our planet, but because the heart of the book is a philosophical exploration of consciousness and patterns of evolution. I'm sure these fields have grown in interesting ways since 1995. This book is exactly what I expected it to be: An overview of the SETI program, coupled with an interrogation of the philosophical issues related to the potential for life on other planets. Davies writes with an engaging style, probing accepted truths with individual acumen and thorough understanding of the subject matter. I believe that consciousness is not as trivial a thing as it appears in the standard biological picture. In fact, it's not a trivial thing at all. It's a fundamental property -- a fundamental emergent property -- of nature, a natural consequence of the outworkings of the laws of physics. In other words consciousness is something that doesn't depend crucially on some specific little accident somewhere along the evolutionary way. To nbe sure, the details of our mentality will depend on the minor and accidental specifics of evolutionary history, but the emergence of consciousness, somewhere and somewhen, in the universe is more or less guaranteed, I claim. I enjoyed the book but I found it a bit frustrating too. Davies identifies two fundamental issues that I have been pondering since reading. 1. Is it the case that life is inevitable given our universe, or is it a stupendous chance, or did it arise from miraculous intervention? Davies believes it is the former - but he doesn't offer any convincing reasons for that belief. However, it is interesting to note that if he is right, other life forms must exist in our vast universe - and as Davies points I enjoyed the book but I found it a bit frustrating too. Davies identifies two fundamental issues that I have been pondering since reading. 1. Is it the case that life is inevitable given our universe, or is it a stupendous chance, or did it arise from miraculous intervention? Davies believes it is the former - but he doesn't offer any convincing reasons for that belief. However, it is interesting to note that if he is right, other life forms must exist in our vast universe - and as Davies points out, they will probably have had a much longer time to evolve into something far more intelligent than us. 2. The universe is finely tuned in a way that makes life form possible. Once again, this can be a massive fluke - but the odds against it are astronomical. Alternatively, there could be multiple (billions?) universes and therefore one of them will beat those odds. (Davies, and I think that to be unlikely). Lastly, it could be a case of intelligent intervention. Davies doesn't say which he prefers but if he rejects the multiverse option, the intelligent intervention options seems the only realistic one left standing. When I looked this book up, I was astounded that there were no reviews on it. I believe I've loaned this one out 2 or 3 times. This is an amazing scientific essay on the possibility of life on other planets, particularly intelligent life. It is also a mathematical contemplation on just how possible that life could sail to our planet and interact with human beings. Davies discusses the stage of life that is possible in our universe given the elements of the number of years invested in dying suns, When I looked this book up, I was astounded that there were no reviews on it. I believe I've loaned this one out 2 or 3 times. This is an amazing scientific essay on the possibility of life on other planets, particularly intelligent life. It is also a mathematical contemplation on just how possible that life could sail to our planet and interact with human beings. Davies discusses the stage of life that is possible in our universe given the elements of the number of years invested in dying suns, the probability of intelligent life given the number of habital planets, while a great deal is given to the amount of space in between possible worlds. There is a lot of assumptions but they are all based on mathematical fact. Learn about the nature of our universe, how planets are made and the proportion of binary star systems, and elements of necessary conditions that would make other worlds condusive to not only survival of species but survival of intelligent life. That is the gift of the book. The conclusion is; of course we are not alone but the odd of anyone else surviving long enough to find us are nearly impossible. Paul Davis makes an erudite speculative inquiry into the burning question of extraterrestrial life. I say, does any scientifically grounded person doubt that there may be other life forms out there in the putatively infinite universe? With new planets being identified in our galaxy by the Kepler Mission, it is only a matter of time before other planets are discovered in the 'Goldilocks' habitable zone of their stars, planets which may well support life at some stage of evolution. We are not like Paul Davis makes an erudite speculative inquiry into the burning question of extraterrestrial life. We are not likely to ever set foot on such a planet, given the travel time involved; but we will surely devise ways of observing them up close. Fascinating, thorough, and insightful. Davies does a good job of plumbing the science of the universe through a philosophical lens, and drawing conclusions based on his philosophic-scientific analysis. Davies considers multiple working theories on the likelihood of life elsewhere as well as the origins of life on earth. Though he doesn't espouse many of the theories he puts forward, this comparative analysis makes his conclusions and opinions that much stronger vis-a-vis other points of view. Gr Fascinating, thorough, and insightful. Davies does a good job of plumbing the science of the universe through a philosophical lens, and drawing conclusions based on his philosophic-scientific analysis. Davies considers multiple working theories on the likelihood of life elsewhere as well as the origins of life on earth. Though he doesn't espouse many of the theories he puts forward, this comparative analysis makes his conclusions and opinions that much stronger vis-a-vis other points of view. Davies presents a good survey of the science, theology and philosophy involved in considering the question, "are we alone in the universe." And there is all sorts of value in exploring, with rockets and radios, to answer the question. Even when our results are unclear, the tools and techniques we created extend our capabilities. Based on lectures, Davies reviews philosophic thought on Man's Place in the Universe, from Copernicus through Christian dogma - was God made alien to save the aliens from their sins too? - and the origins of intelligent life and DNA. Much the same as the previous book I read, but from a slightly different angle. Essentially, why SETI. Well written essay on the implications and possibilities of other life in the universe. While the book laid out a variety of possibilities, it never went deep enough to ever make a point of what would happen to humans, society, religion, etc. Worthwhile, but not nearly what I was hoping it would be based on previous reviews. This has some pretty interesting insights on extraterrestrial life. A rather interesting and very enjoyable little book which gives us such huge scope for thought.